The Christmas Village is filling up, and we don’t want you to miss out. We are accepting vendors to sell “gifts ‘n goodies” during The Gift Festival this year. The event begins at 4pm and continues until 10pm. 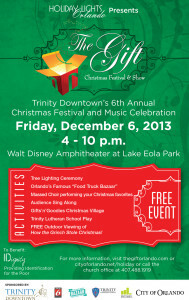 Enjoy a fun evening and spread the Christmas joy in Orlando December 6th! Sign up now! We are a few weeks away! Exciting time! Have a Happy Thanksgiving and join us December 6th! 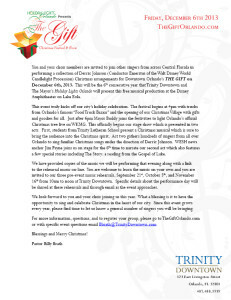 You and your choir members are invited to join other singers from across Central Florida in performing a collection of Derric Johnson (Conductor Emeritus of the Walt Disney World Candlelight Procession) Christmas arrangements for Downtown Orlando’s THE GIFT on December 6th, 2013. 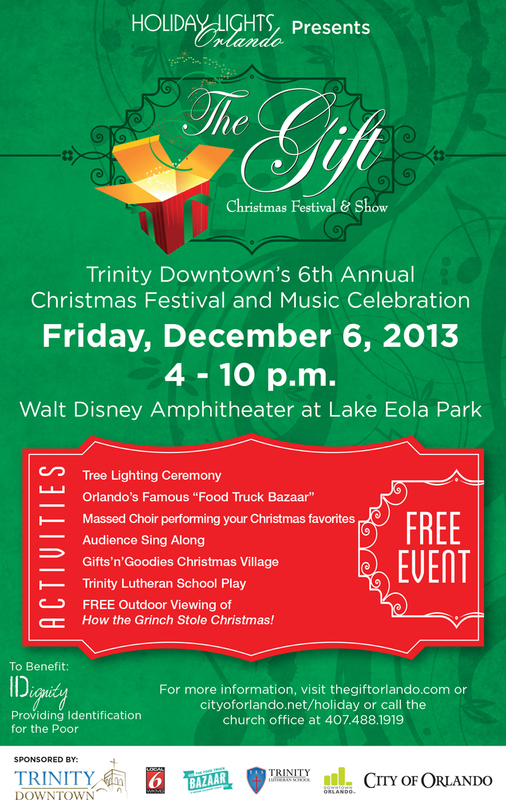 This will be the 6th consecutive year that Trinity Downtown and The Mayor’s Holiday Lights Orlando will present this free musical production at the Disney Amphitheater on Lake Eola. Registration now open for individuals and groups to be a part of The Gift Mass Choir! Register today and you will receive access to the music charts and rehearsal mp3 files. No matter if you are a vocal professional or just enjoy singing as a hobby, these rehearsal tracks will learn you the music in no time. Moreover, there is a great chance that you are pretty familiar with the songs! Register today! 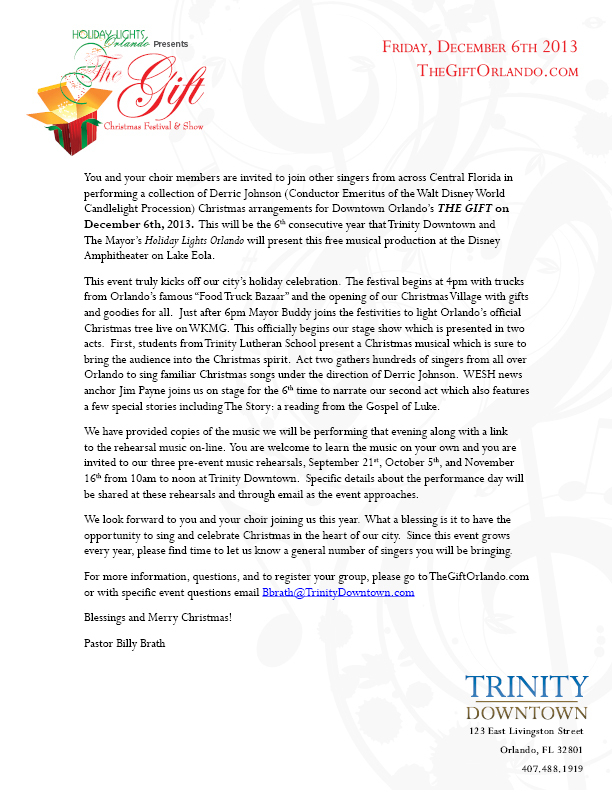 We are looking forward to you joining us in singing at The Gift this year! We are excited to announce the music for this years stage production of The Gift. For the 4th year we welcome Derric Johnson as our conductor for the 2nd Act of The Gift on December 6th. Derric has blessed Orlando for decades with his music, arrangements, and as the conductor of Disney’s Candlelight Processional. We are pleased to not only feature Derric as our conductor, but are blessed once again to perform his famous arrangements of classic Christmas music. Our music lineup is especially important for all the singers in Orlando because The Gift choir is made up of singers from all over Orlando! 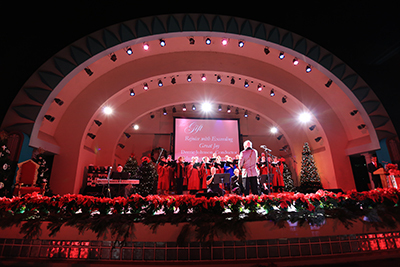 We invite you to join us as we sing out these classic songs and bring in the season for downtown Orlando. If you or your choir is interested in joining our production please click here for more information and to register. Live Stage show to follow in two acts!